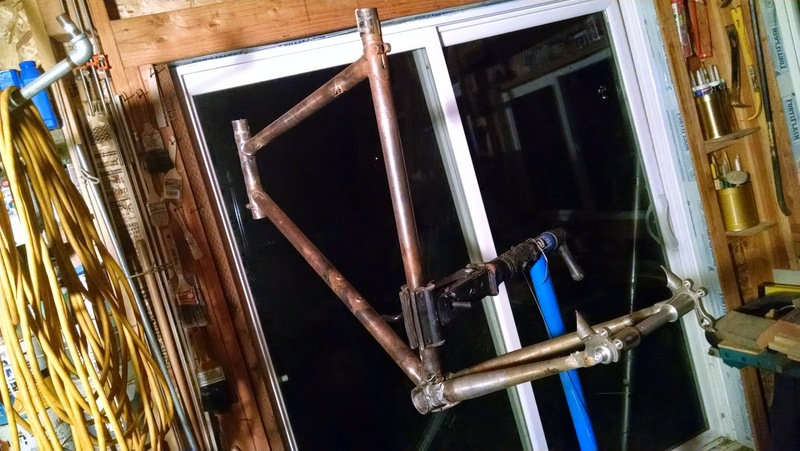 Read as a grumpy amateur builds his first... er, now third bike! Note to readers: I've never done any of this before, do not copy me without further research and sense (common or otherwise). 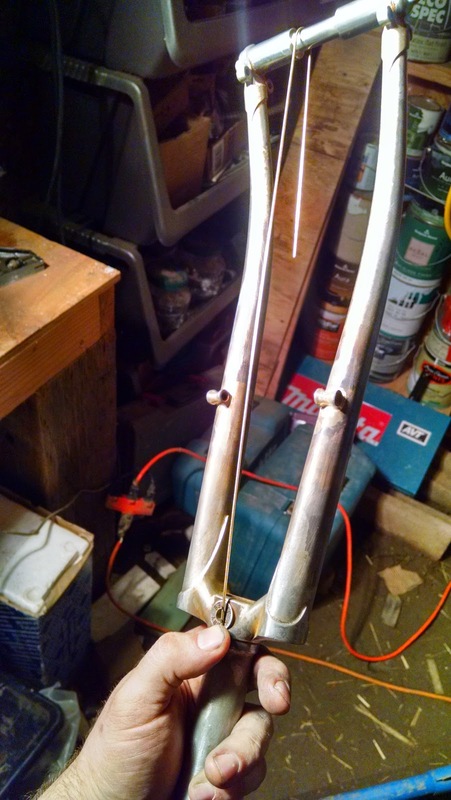 I brazed the brake and chainstay bridges on Monday. 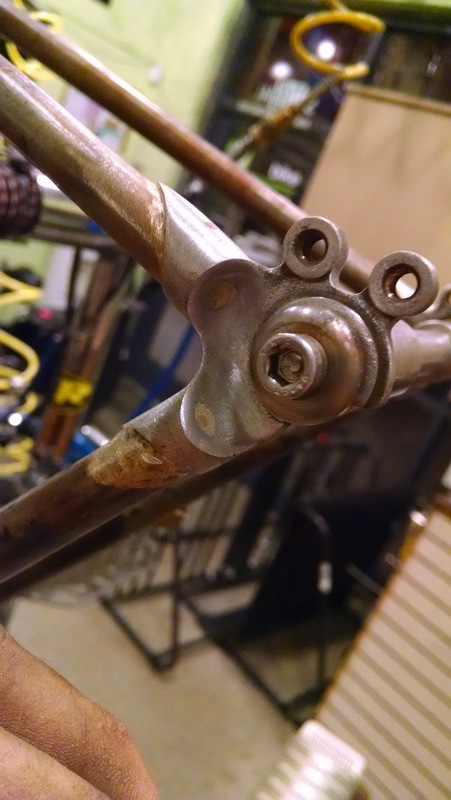 I wanted to keep the height consistent between the front and back brake. 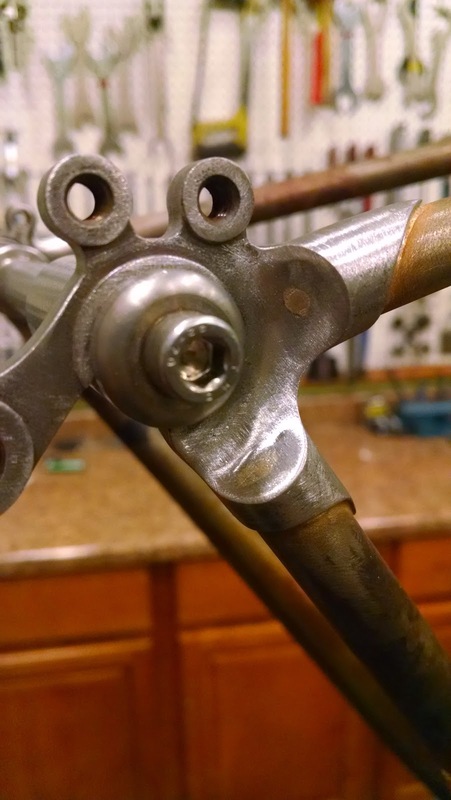 I also wanted the fender mounts to be the same distance from the dropout. 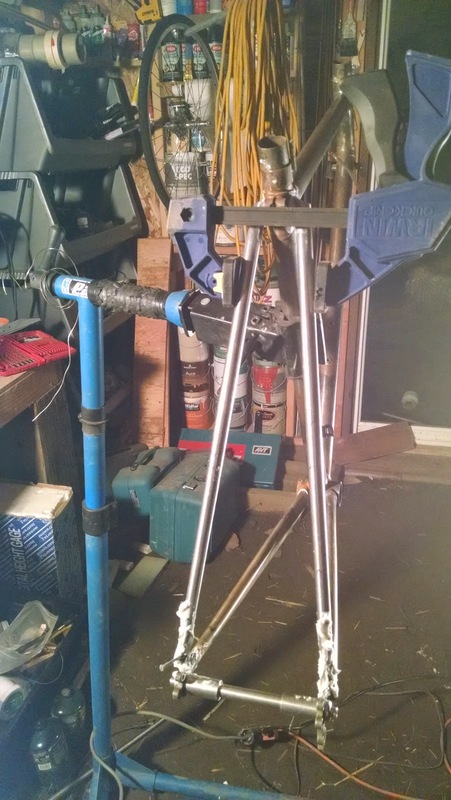 I measured things out with a pair of Anvil axles and a bent brazing rod. 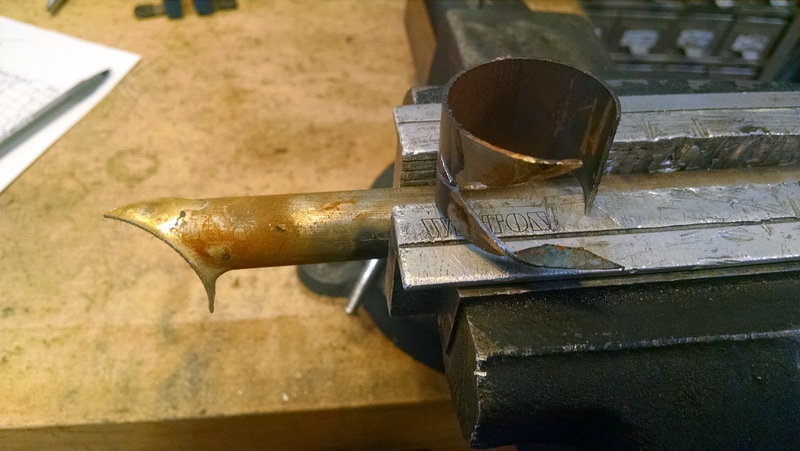 Once I had the approximate position of the bridge, I found the widths of the deepest cuts with a caliper, added some breathing room, marked them, and went to work with a file. It took some trial and error, but I got things nice and even for the brake bridge. 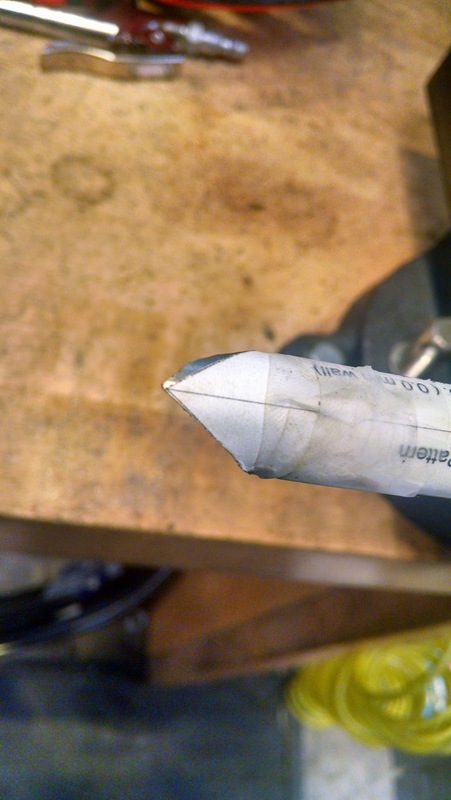 Doing the last tiny bit with some emery cloth and a scrap seat stay really helped. 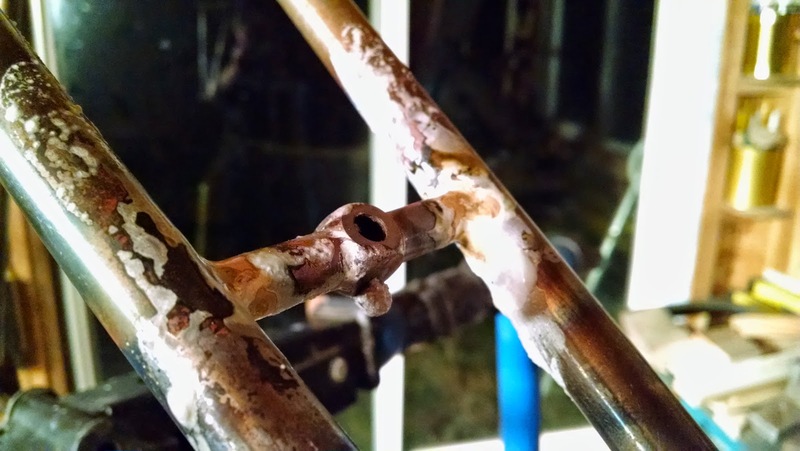 The brazing went pretty smoothly. I think I'm starting to get the hang of 50N silver. 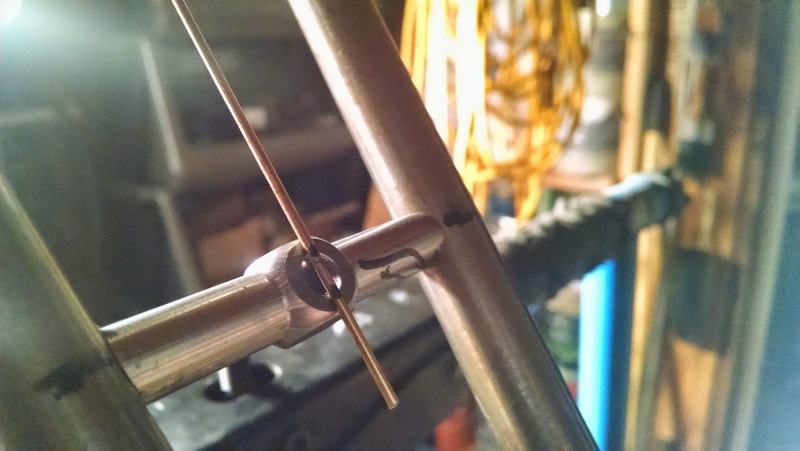 Here's one of the fender eyelets in inaction. 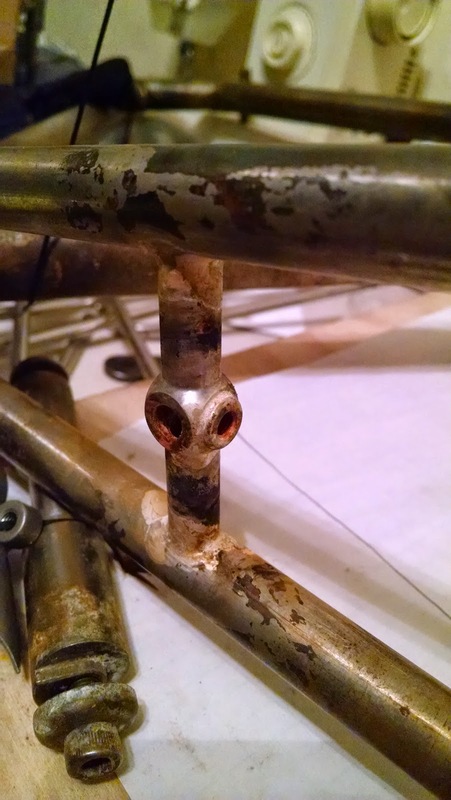 I just drilled a hole in each bridge, cut the eyelet short enough not to get in the way of brake mounting, etc, and brazed it in place. Next week: sealing the seat stays, touch up with solder, grinding out the tubes in the BB area, thinking about cargo racks. 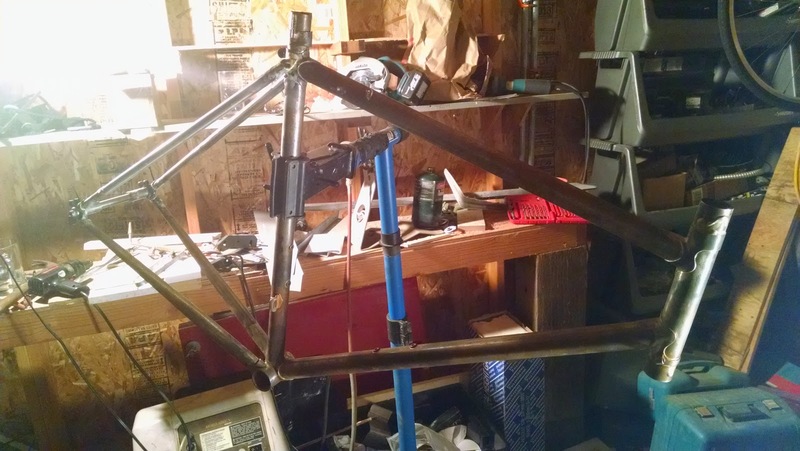 Over the last week I've gotten the rest of the rear triangle done. 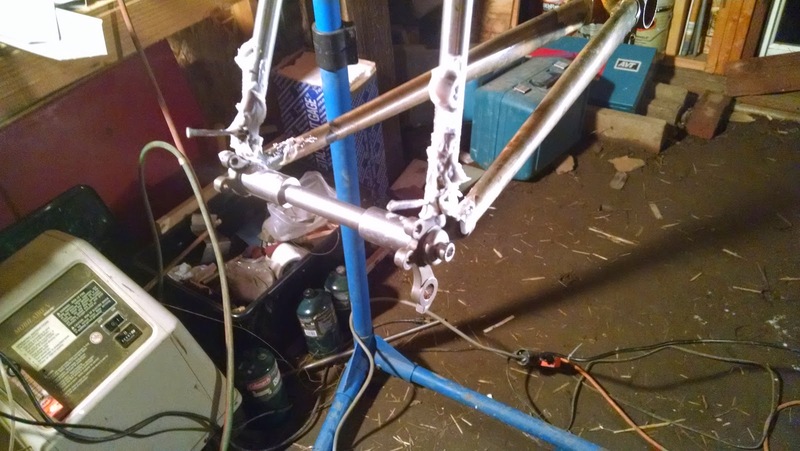 Step one was getting the other chainstay installed and adjusted to keep the rear wheel straight. 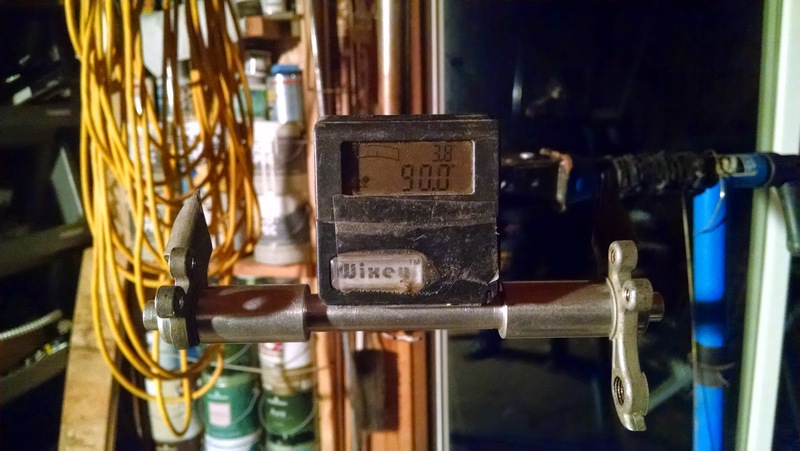 I was pretty close and it only took a bit of bending to get it to 90 degrees. 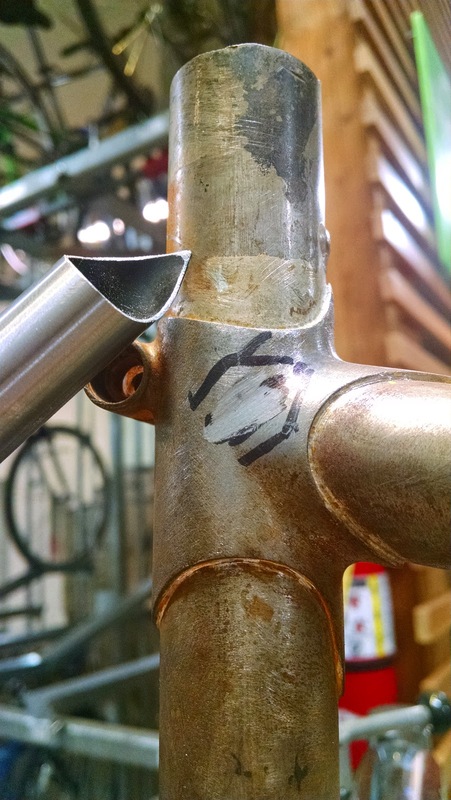 As before, I referenced the head tube to try to keep everything in line. 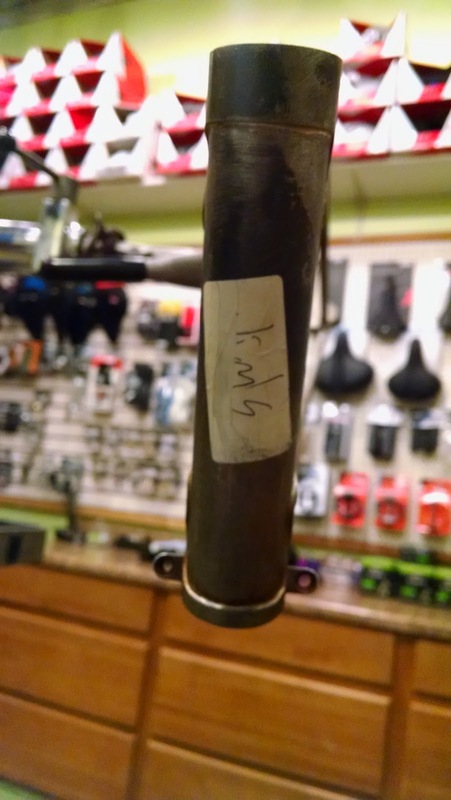 Then it was on to the seatstays. I really like a particular kind of scalloped end cap. 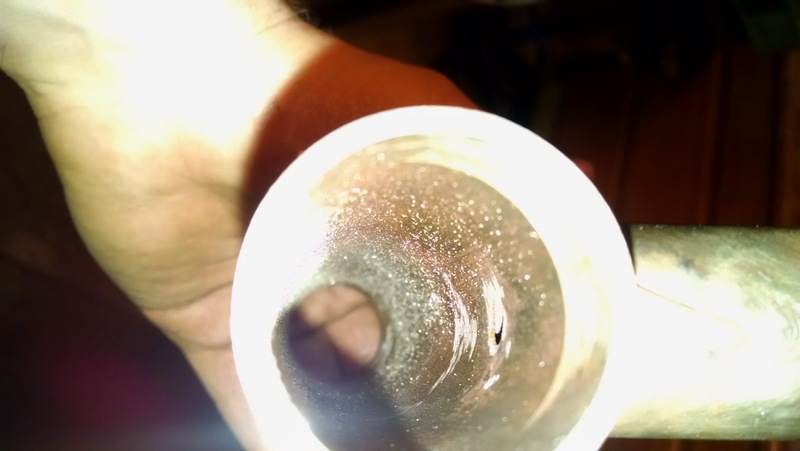 It's made by brass brazing a piece of 31.8 tubing to the end, then cutting it out and filing it down. 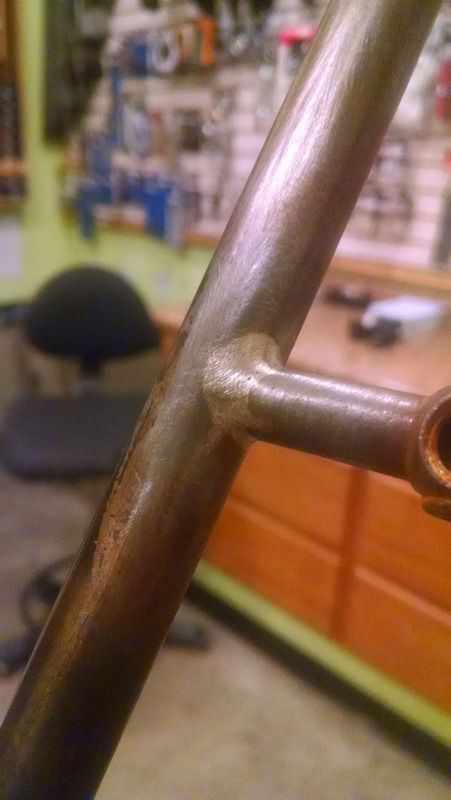 I use brass because it won't melt when silver brazing the finished piece on the side of the seat lug. Miter template and rough cut. 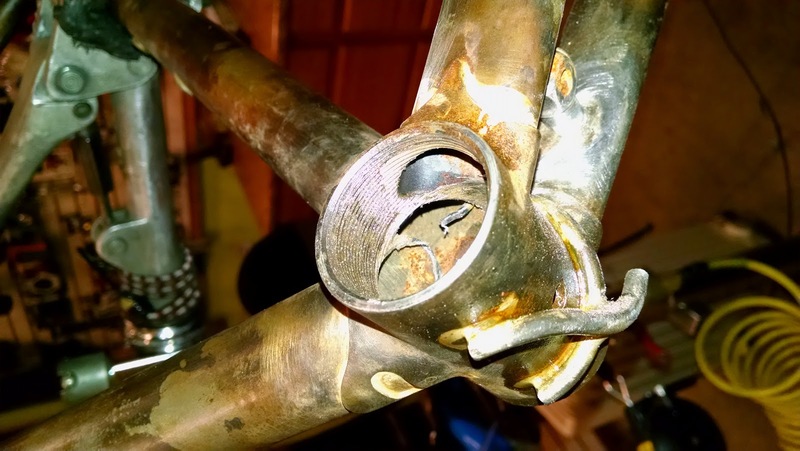 surface area of the braze. 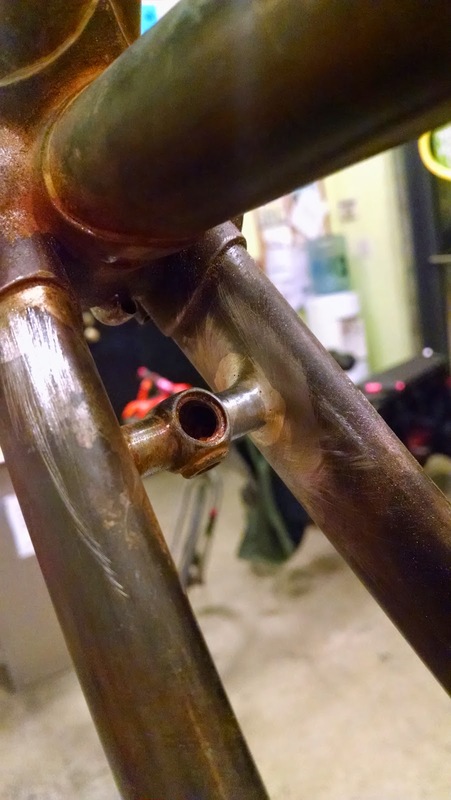 Trimming the excess, post brazing. Attaching the stays was pretty straightforward. A little pressure at the top and a pin in each dropout kept things in place while I got the first two brazes done, then I moved the clamp down to braze the tops. 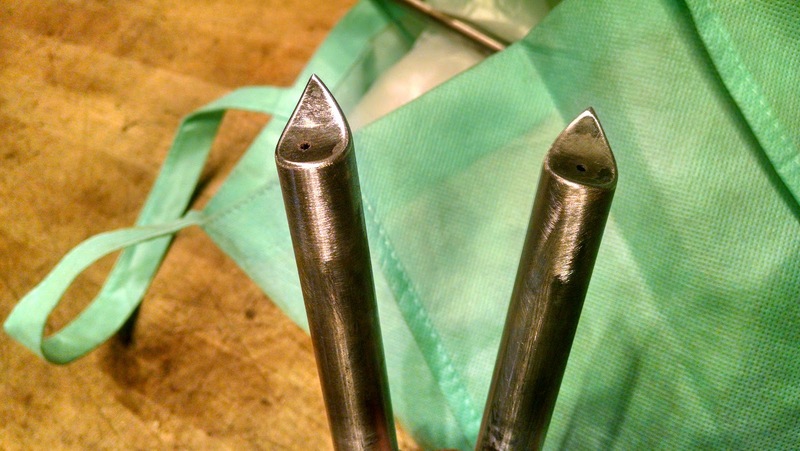 Both were done with 50N silver because the bottom was a bit gappy and the top needed to build up a bit of a fillet for strength. 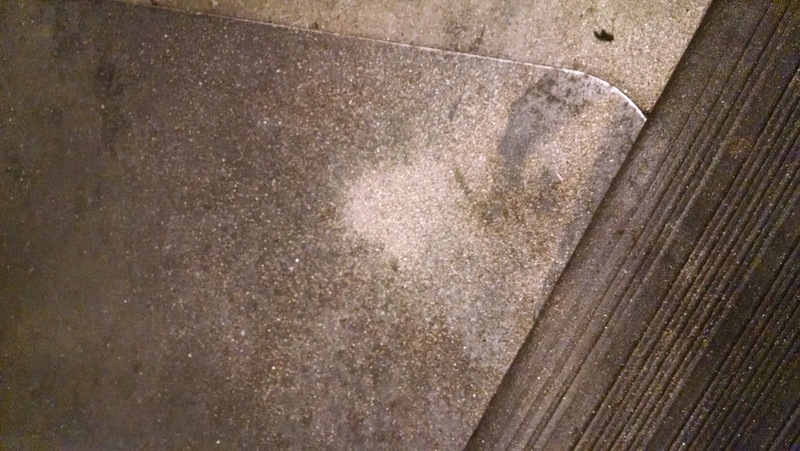 Copyright Jim Burakoff, 2012. Simple theme. Theme images by enjoynz. Powered by Blogger.